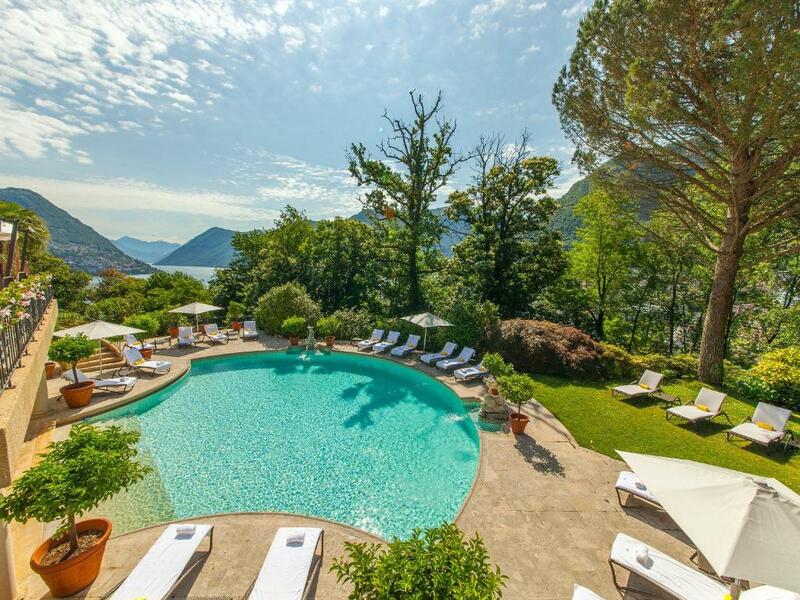 Lock in a great price for Villa Principe Leopoldo – rated 8.9 by recent guests! Friendly service, beautiful building, big room. Would definitely recommend going in the summer though. An outstanding resort in beautiful city with friendly staff and good services. The property is beautiful, and the room and view were spectacular! 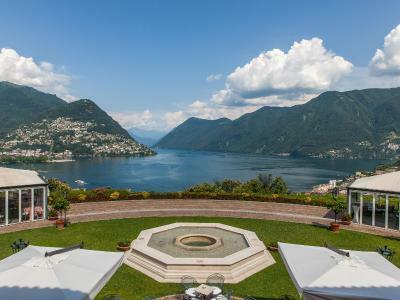 Absolutely beautiful and elegant property with panoramic views of Lugano. 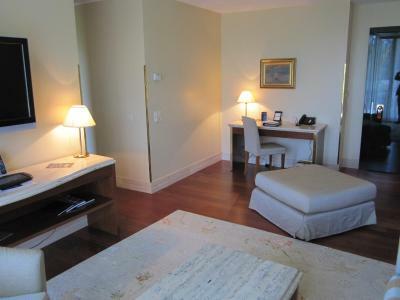 Well appointed, large room with all the amenities one could want. Fabulous Michelin starred restaurant (pricey) and outstanding breakfast buffet. You pay for it all, but it's totally worth it. 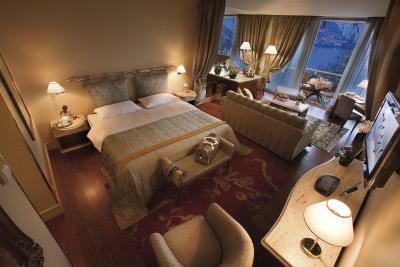 Really Beautiful Villa, breathtaking views of the lake Lugano and the mountains. Upscale resort for couples and families. Gorgeous and comfortable rooms. Over the top amazing! Staff is fabulous. Lino was so helpful when i needed a taxi or anything else. The restaurant staff are on a slow pace but I was on business pace. Nice break from the speed of normal life. Sweet treats to include black licorice in the lobby. Even had an extra afternoon and who can beat drinks and shopping while at the pool! I hope I can gets reservation when I need it for June 2019! An amazing hotel! It was gorgeous and comfortable. The staff was accommodating, and the view of the lake was stunning. I like to return asap. 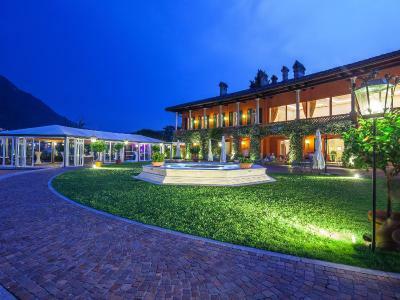 Villa Principe Leopoldo This rating is a reflection of how the property compares to the industry standard when it comes to price, facilities and services available. It's based on a self-evaluation by the property. Use this rating to help choose your stay! 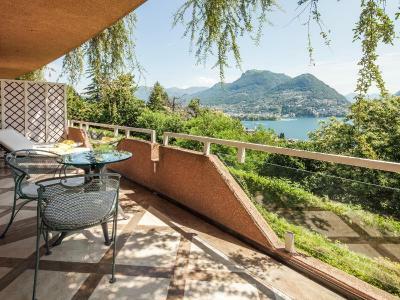 Villa Principe Leopoldo can be found amid a large park above Lugano, offering panoramic views of Lake Lugano and the mountains, and featuring leisure, sport and wellness facilities, as well as exquisite dining options. WiFi is available for free. 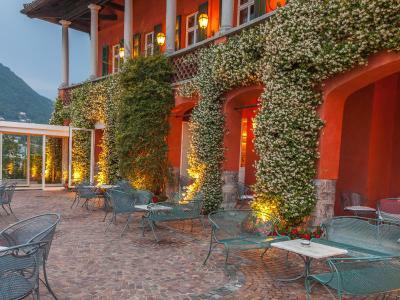 A Member of Relais & Chateaux, Villa Principe Leopoldo is a harmonious blend of Italian charm and Swiss excellence. The Kiso Spa offers a relaxing ambiance made with personalized treatments based on the Villa Principe's own top-quality cosmetic line. 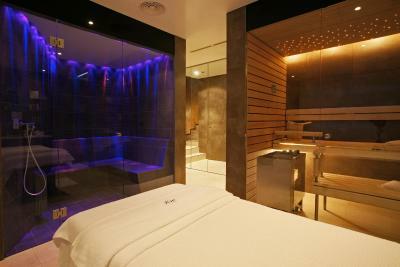 Hot tub, sauna and steam bath facilities are also featured. The Principe Leopoldo Restaurant received excellent reviews in the most important international guides. The Piano Bar & Lounge offers an exclusive selection of cocktails and wines, champagne and malt whiskeys, all accompanied by live music. 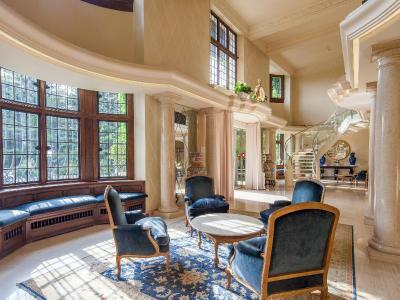 A breakfast room is located in each building. 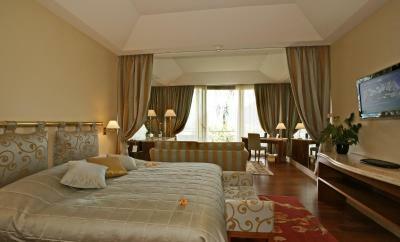 The spacious and stylishly decorated guest rooms are all air-conditioned. 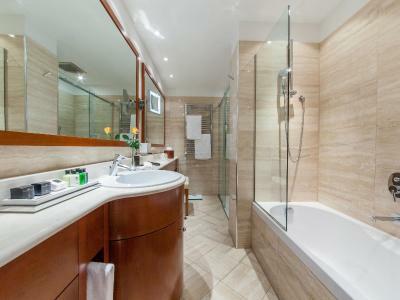 Bathrobes and slippers can be found in the luxurious bathrooms. 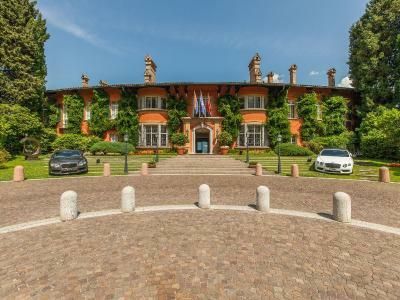 Villa Principe Leopoldo is 1.2 mi from the city center of Lugano. Private outdoor parking is available on site for free. Garage parking is possible at an additional cost. 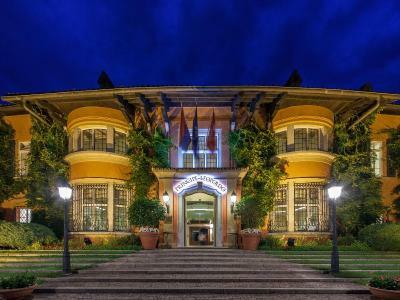 When would you like to stay at Villa Principe Leopoldo? 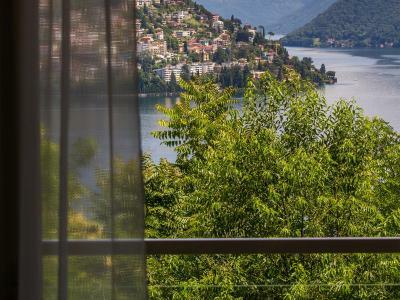 In the main Villa building, this spacious, stylishly decorated and air-conditioned suite includes a luxurious bathroom and a large terrace overlooking Lake Lugano, the surrounding mountains and the city. In the main Villa building, this stylishly decorated and air-conditioned room includes a luxurious bathroom and a balcony overlooking the garden. 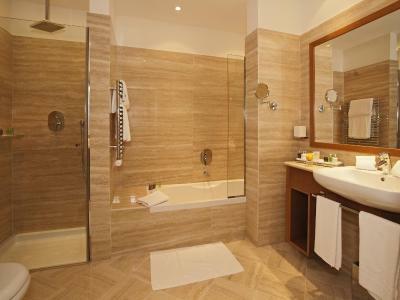 In the main Villa building, this spacious, stylishly decorated and air-conditioned suite includes a luxurious bathroom and a large terrace overlooking the garden. This suite has air conditioning, cable TV and mini-bar. 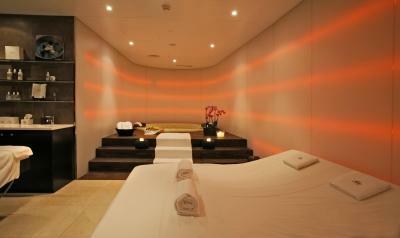 1 hour of private spa access is included in the room rate. Please note that it has to be booked before arrival. Contact details are stated in the booking confirmation. This suite has air conditioning, satellite TV and bathrobe. 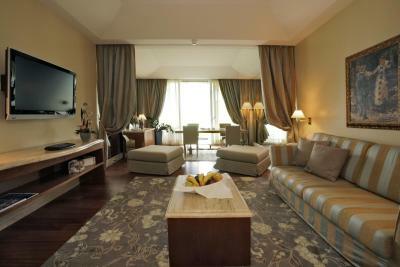 This suite features a satellite TV, seating area and air conditioning. This suite has a seating area, bathrobe and cable TV. This suite has air conditioning, seating area and bathrobe. The historical residence, with its typical architecture, inspired by local Heimatstil, dominates the lake of Lugano from the Canton of Ticino’s most magical spot, the fabulous “Collina d’Oro”, offering breath-taking views on the spectacular surrounding: the mountain ranges, the transparent lake and sky, the seasonal changing colours of the nearby woods and the city’s thousand lights. After having served as the summer residence of this distinguished family, in 1986 it became a prestigious hotel structure, giving hospitality for different periods of time to the most illustrious figures of noble descent in Europe. 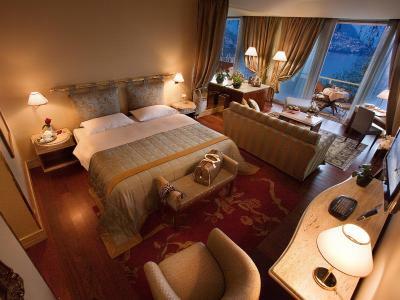 Member of the prestigious Relais & Chateaux collection, the Villa Principe Leopoldo Hotel is, today, undoubtedly, the most exclusive among the hotels of the Ticino Hotels Group and boasts 37 spacious suites, among which, Signature, Princess Garden, Panorama, Deluxe the Junior Suite. At the Principe Leopoldo Restaurant, hand embroidered linen tablecloths, precious silverware and refined crystals are the backdrop to sublime meals, served with a selection of top quality wines. House Rules Villa Principe Leopoldo takes special requests – add in the next step! Villa Principe Leopoldo accepts these cards and reserves the right to temporarily hold an amount prior to arrival. Reservations for the gourmet restaurant Principe Leopoldo and treatments at the Kiso Spa are mandatory and should be arranged prior to arrival by contacting the hotel.Please note that credit cards from third parties are not accepted.Please note that the 2 heated outdoor swimming pools are only accessible from May to September. Please note that the city tax includes the Ticino Ticket. It offers free benefits and discounts in the Canton of Ticino, including free use of train and bus services. For more details, please contact the property directly. I’m gonna go back for sure!!!! The location is such that you really go there for the hotel. For most people it is not possible to get down to the lake or elsewhere without transport. I was surprised at what appeared to be a very limited choice of wines by the glass. For these types of hotel it is very difficult for the staff to balance professionalism and appearing supercilious. I found the staff here were slightly on the wrong side of the balance. This is a luxury hotel. The room and in room facilities were excellent. The pool looked pleasant. Their gourmet restaurant was reasonable as such. The gardens were well kept and the view from the terrace magnificent.